Here's a milestone. My 100th post on Iconic Guitars. I've not been posting as regularly as I would like so I guess I should have reached it long ago. I have covered quite a number of Guild Starfire in the past. At $2,500 "buy it now" but you can make an offer (try $2,000 - $2,200, you never know). If like me you couldn't be at NAMM, here is a picture of Slash and a prototype of the much anticipated "Apetite for Destruction" Les Paul reissue. I would guess that this is the Gibson USA model and that the previous "sneak peak" was the Custom Shop version based on the colors (softer look for the Custom Shop). All the details about the new Slash Les Paul here. If you're interested by previous Slash models, have a look on eBay . 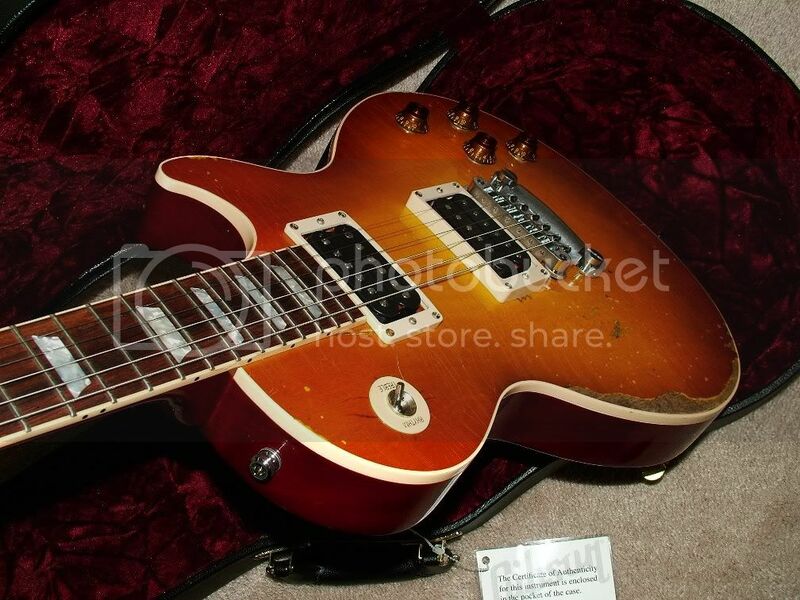 >> Check Slash Les Paul guitars on eBay now! Gibson just released a preview of the new Slash signature Les Paul on their blog to announce the sneak peak they will host at NAMM this Saturday (with Slash himself visiting at 3.30pm if you're around). They are confirming what we knew (see previous post): it's "inspired by the axe that the legendary Guns and Roses guitar hero played on the multi-platinum selling “Appetite for Destruction” album and practically every recording since". It's gonna be out soon. Like the Slash model released in 2008, there will be different versions to cater to every wallet: the Slash “Appetite for Destruction" Les Paul "will be released in the coming weeks in limited quantities from Gibson USA, Gibson Custom Division and from Epiphone." It really looks like the Derrig replica that Slash owns (as shown on the left), very figured top, only in less orangey -which is a good thing, this is not the 80s anymore. I am a big fan of the zebra-pickups look. One thing to notice is that the Slash model will have Slash's "smoking skull" signature on the head which I am not a big fan of. That being said, I am guessing this is only on the Gibson USA and Epiphone models. I imagine the Custom Shop version won't have it and will look like the real deal therefore. My 2008 Custom Shop Slash Signature has the classic "Les Paul model" peghead with the regular "Standard" trussrod cover. That's how it should be. I'm now awaiting the price for this new iconic guitar to see if I'm going to complete my Slash Signature collection. I'm especially fan of the double cutaway versions - I bought one for my daughter when she was born 2 years ago when Gibson has reissued those for cheap. And I love vintage models with a soft spot for 1977 runs (my year of birth). So this guitar I found yesterday on eBay combines them all!
. It seems in good condition and the bids have not yet taken off (it's still under the reserve price as of writing). So maybe there is a good deal here to be had. He painted Clapton #2 in 2002. I guess this guitar is still with Clapton. Original Crash-2. Painted by CRASH for Clapton in 2002. Then in 2004 he painted a limited seried of 50 guitars for Fender, each with a unique design (+1 for his friend John Mayer). Those have Crash's signature engraved on the neckplate and masterbuilder Todd Krause's signature stamped on the back of the headstock. What's odd too is that "while the 50 Custom Shop Crashocasters feature specifications similar to the Eric Clapton Signature model, they are not EC Signature guitars." So this odd "crashocaster" is definitely not from that run. You sometimes see on eBay basic strats with the odd or truly horrible paintjob that tries to emulate Clapton's Number 3 Crashocaster (the most famous, also know as "over the rainbow"). But this guitar is in a different league and looks like the real deal. Anyway, it's going for $1,525 (reserve not met) as of writing. So maybe you can get a good deal on a Fender Custom Shop Eric Clapton model (those are worth double that!) and get this unique finish on top of it.